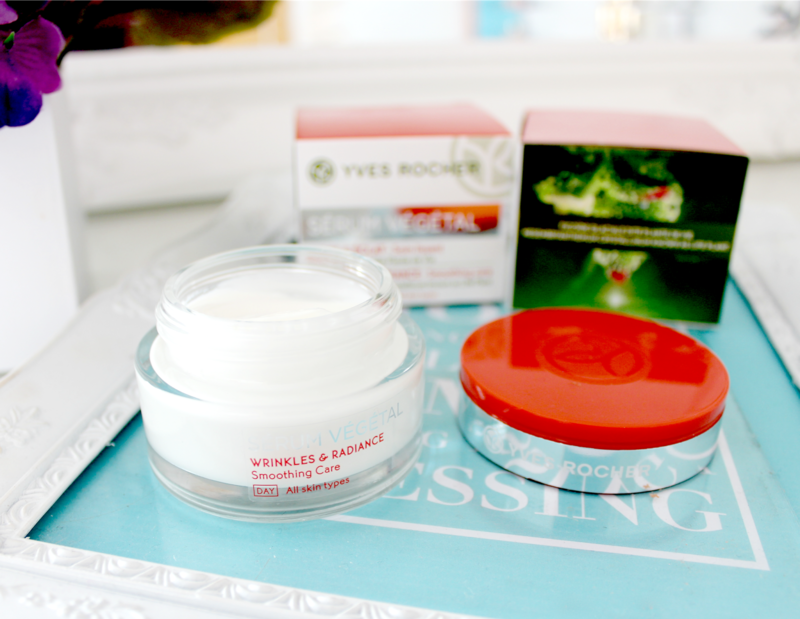 I love testing out new skincare products and the most recent one I've been trying is from Yves Rocher. If you haven't heard of Yves Rocher before, the brand is passionate about botanical beauty and believes this is the future of beauty. They have their own botanical garden in La Gacilly where they grow more than 1100 species of plant to use in their products. Their products are sold in 88 countries worldwide, with more than 30 million customers. Very impressive! I've tried a few products from the brand now and have been highly impressed each time - everything I've tried has been such lovely quality and I love their packaging too - it's simple but has an expensive feel to it. Their new release is the Serum Vegetal and I've been trying out the Wrinkles & Radiance Smoothing Day Care and Smoothing Night Care serums*, both of which come in lovely little glass pots and have a milky lotion like consistency. Although I'm only 24 and don't have wrinkles just yet (although I am starting to see fine lines, eek!) I've always been told that prevention is better than cure so I like to incorporate anti-ageing products into my skincare regime now so they can get to work before those pesky signs of ageing do appear. The star ingredient in these exclusive new facial serums is the super powerful mesembryanthemum crystalline (wow, what a mouthful) otherwise known as the crystalline ice, or life plant! Perfectly absorbed by the skin, this incredible botanical property stimulates the skin's protein which reactivates the cellular mechanisms that fight wrinkles. If this all sounds a bit too scientific, you can watch this video which explains the science behind the serum! So now you know what it does, does it actually work? Well, I can't say just yet as I feel I'd need to use it a little longer but on first impressions, it's a beautiful product. 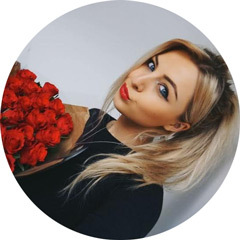 It sinks into the skin straight away leaving it feeling hydrated and plump as well as looking lovely and radiant. I definitely feel like I'm doing my skin some good by using it and I and hope to see great effects after long term use. I'll keep you all updated. Just so you have another opinion on the product - my mum has also been trying it out and she absolutely loves it. She said it plumps up her skin and makes her look more youthful and that's coming from someone that does have wrinkles (sorry mum!) so I guess it's suitable for all skin types and all ages! So now for the exciting part. 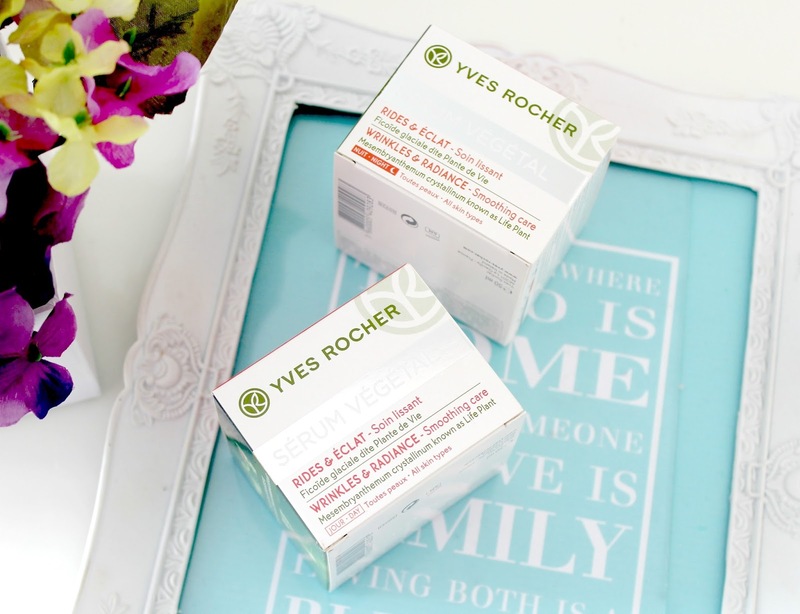 Yves Rocher are very kindly giving one of my readers the chance to win these fabulous day and night serums (worth £42) so if you think this is something you'd like to try, make sure you enter using the Rafflecopter widget below. It's super simple to enter so don't be put off by having to do lots of different things - I've tried to keep things as simple as possible! However, if you want to up your chances, there's a few simple things you can do such as visiting the Yves Rocher website, following them on Twitter or tweeting about the giveaway. Good luck guys!! Ooh i need to get on the anti ageing product bandwagon pronto! these serums sound lovely! I agree prevention is better than trying to cure!! Sounds like an awesome product! I would love to try the Carambola from Malaysia Fresh Shower Gel! I've never tried anything from them but I've entered the giveaway so hopefully I will soon! I'd like to try Anti-Fatigue Iced Gel. The Smoothing Night Care serum sounds great! Oh my goodness I LOVE these creams! :D Great for a give away! I'd looove to try the Youth Intensifier Serum! Hey hey! The new blog design looks awesome. Chaitra did a great job! I couldn't find the range but I did a search with those terms. The cherry blossom body lotion sounds heavenly! http://www.yves-rocher.co.uk/control/product/~category_id=5000/~pcategory=5000/~product_id=20336?cmSrc=Category - as my hair needs some love and attention!! I have fibromyalgia so this would be great for me. I would love to try the Botanical Hair Care Nutri-Silky Mask. The rinsing vinegar, have to try that! !